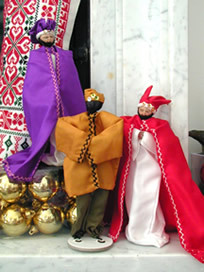 These handcarved holiday decorations will remind you of the Holy Land. 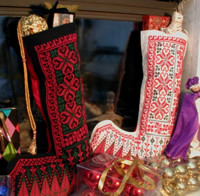 Made by artisans of Beit Sahour and Bethlehem. These whimsical dolls are a favorite at Sunbula! Colourful handmade costumes cover flexible wireframe bodies. 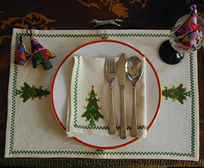 Set includes nine pieces. Aprox. 20 cm high. Made by YWCA. Cocktail Party square coaster. Made by SWC. Cocktail Napkin. Made by SWC. Xmas tree runner. Made by SWC. 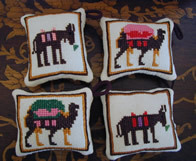 Embroidered potholder. Made by SWC. Embroidered with colourful geometric design. White cotton backing. 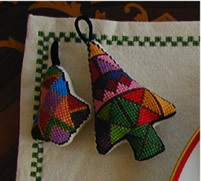 Set of 4, two trees and two bells. Made by SWC. Christmas tree (1st. from left). 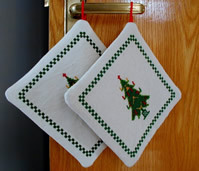 A decorative hanging for the holiday season. Made by UNR. Santa (2nd. from left). Made by PAS. The flight to Egypt (2nd. from right). Made by PAS. Aerobic Santa Claus (1st. from right). Made by PAS.